Your worship facility has worked hard to raise the funds to purchase church chair. There are many factors that will influence your decision-making process when choosing the right worship chair for your facility. Church seating today is available in three typical choices: traditional pews, theater seating, and stackable chairs. The determining factors in which style is chosen is generally put in the hands of the pastor and a committee and is ultimately determined by congregation size, congregation needs, building codes, and the personal taste of the committee members. Due to the multiple use needs of today’s worship space, stackable chairs are the choice of seating for many churches and will be the main topic herein. You not only need to consider the size of your congregation for your seating needs but also the physical size of your attendees. A few chair manufacturers offer chairs in sizes to fit toddlers for youth rooms, to standard widths of 16-20”, to wider chair seats that are 22-23” wide for larger attendees, to a 40-inch bench-type seat wide enough to seat a mother and young child. The availability of arms on chairs is well-suited for the elderly attending worship services. The best value and quality in church seating are typically sold directly by the chair manufacturer and provide the greatest flexibility in purchasing a custom-made chair at a lower cost to match your décor in your choice of fabric and frame color. You will need to consider local building and fire codes and should consult the local fire marshall before the purchasing process begins. It is most important that you are aware of the codes you may be required to meet. Be sure to ask the sales representative for documentation regarding their chair compliance to the codes you need to meet. Before you place your final order, be sure to request a sample chair from at least two chair companies. The reputation of the company and their chair warranty should be one of the most important factors in your purchase decision. Comfort and support should be the primary factors. Sit on the chair and give it one-hour chair-seating test. Comfort begins with the frame design. To appeal to a range of human heights, the combined seat height and foam thickness should total about 18 inches. Less seat height or seat foam thickness causes uncomfortable pressure, no matter the cushioning materials. Cushioning used for church seating is different than you'd find in household furniture. To provide seating for comfort over a period of hours requires much firmer foam than would be found in a sofa or upholstered living room chair. In fact, cushioning should be about three times firmer than that which would be used in the home. You also need to consider the support factor, which is the relationship of surface firmness to deep down support. Cushioning should have a minimum support factor of 1.9. That means that it takes about twice as much weight to compress the cushioning to half its height than required to compress the cushion surface. That extra amount of deep down support prevents "bottoming out" on the chair seat, eliminating the major cause of congregation discomfort. In today’s economy, price is always a factor. The old saying, “You get what you pay for” never held so much truth. Quality and price go hand-in-hand along with a good warranty. Research and buy the best quality chair you can afford. The bit more you pay in price will pay off in the long-term use of the chair and negate the need to replace your purchase in a short period of time. Now that we have covered the types of church seating, building/fire codes, sample chair test, warranty, comfort and pricing, here are the five most frequently asked questions about church seating. 1. Which chair style will best suit my worship space and how will I know how many chairs will fit into my space? Chair style selection is typically made by the personal taste of the purchasing committee or designer to match the interior décor of the worship space. Chairs come in metal or wood frames in various widths, allowing you to fit more or less chairs into a space according to your seating needs. 2. What are the chair options? Most stackable chair companies offer several chair options, including numerous fabric styles, numerous frame colors, bookracks, card or book pockets, pew ends, ganging, kneelers, book boxes, card boxes, shortened legs, and custom abilities. 3. Are the chairs ergonomic and will they provide long-term comfort? Be sure to check that the chairs you are purchasing have been built using ergonomic technology and have built-in lumbar support. The frame build and the foam used in the chair are important factors for long-term use to provide continued comfort after hours and years of use. 4. What is the chair warranty – what does it cover and will the chair frames need maintenance requiring tightening of screws or are they put together with welds? Chair warranties vary vastly in the chair industry, as does the chair frame build. Ask for a written copy of the chair warranty. It should include the frame, fabric, and foam. 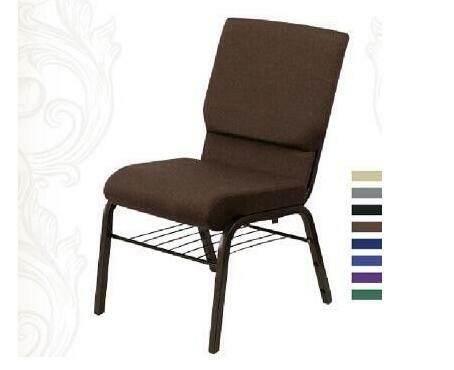 Chairs with welded frames do not require the ongoing maintenance of frames put together with screws. 5. How will the chairs be delivered? Are they in boxes that I have to take apart and dispose of? Will the chairs need to be assembled or will they arrive assembled and ready to use? For most chair companies, there are two primary ways to ship: common carrier or dedicated carrier. Common carriers, or LTL companies, use a formula based on weight, space, and distance and ship several different items on the same truck. Dedicated loads only have items from one pickup point from one manufacturer. The entire trailer is owned or rented by the manufacturer and contains only their products. Boxing of chairs varies with each chair company. Ask what your delivery charges entail in detail. Depending on the chair company, your chairs may require assembly upon arrival. After all the decisions are made and the chairs are in place, your congregation should enjoy years of comfortable seating.